Overall, Canada may be considered a freshwater-rich country: on an average annual basis, Canadian rivers discharge close to 9% of the world's renewable water supply, while Canada has less than 1% of the world's population. 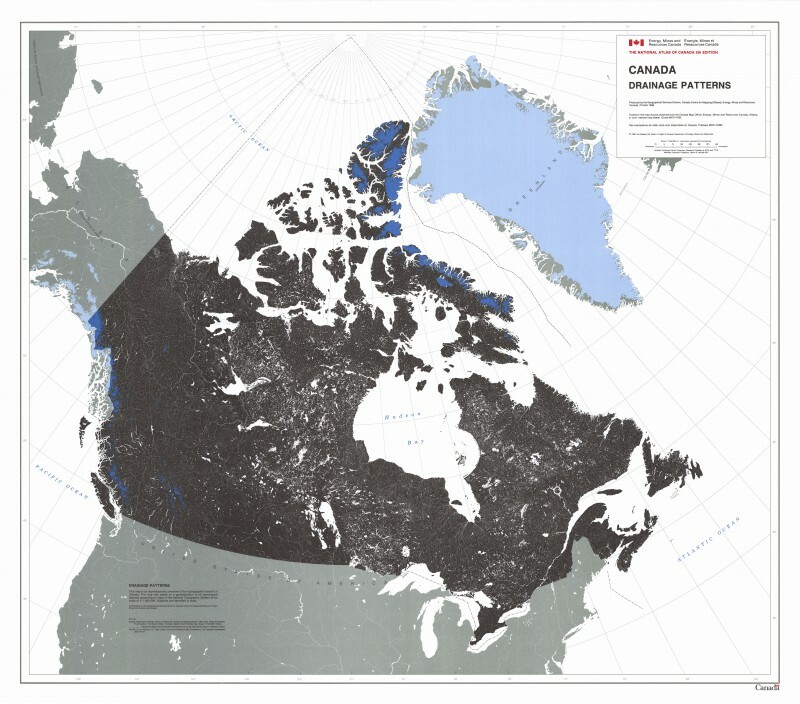 Water is also highly visible in Canada: probably no country in the world has as much of its surface area covered by freshwater as does Canada. Of particular note are the Great Lakes. This set of lakes, which is shared with the United States, makes up the largest surface area of freshwater found in one place anywhere in the world. Water is used in the resources and energy industries. A watershed is an area that drains all precipitation received as a runoff or base flow (groundwater sources) into a particular river or set of rivers. The easiest way to describe the network of rivers and lakes on a small-scale map is to show the watersheds. 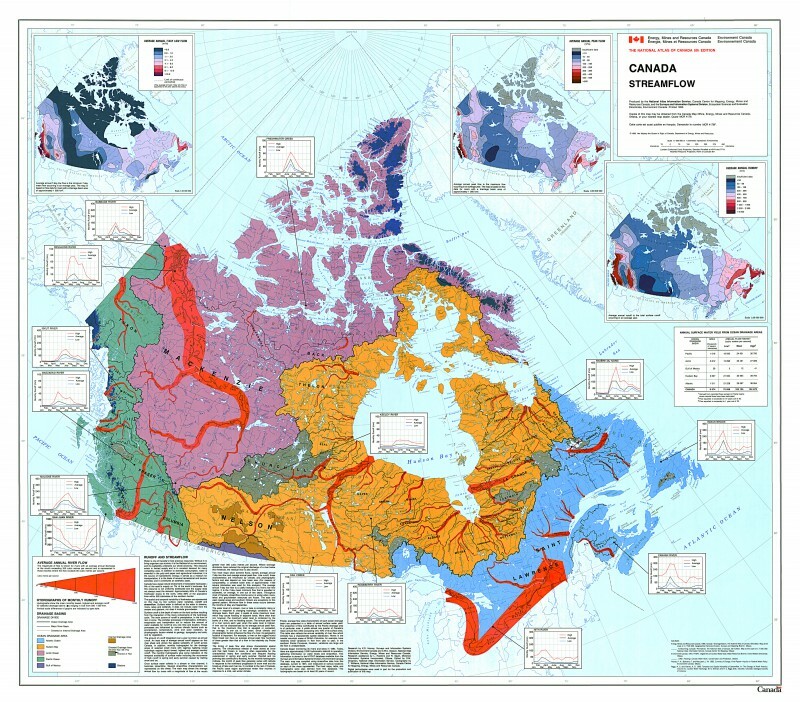 In Canada, there is a detailed hierarchy of watersheds, ranging from the largest (drainage into oceans and their equivalents), down to the smallest ramification. 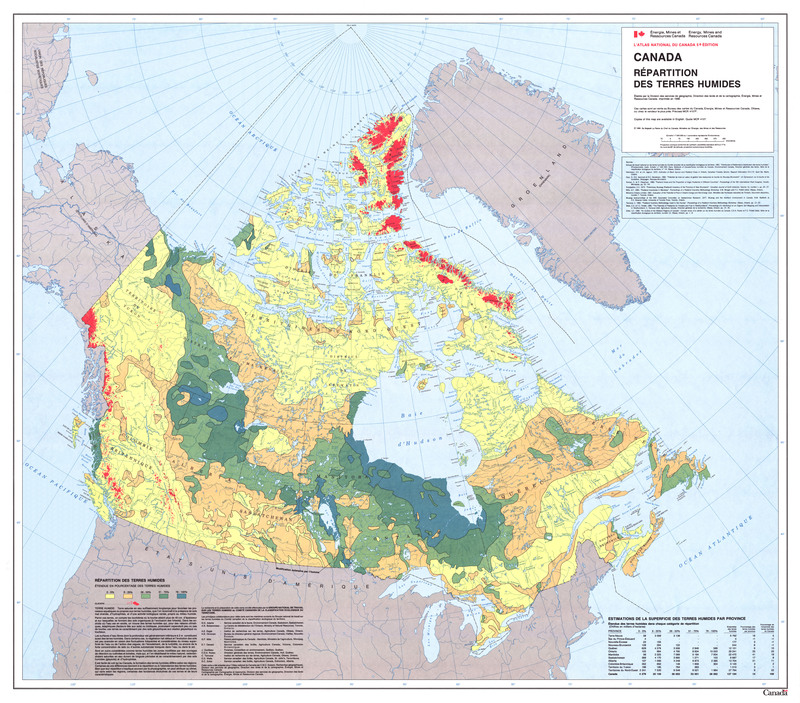 Canada’s ocean watersheds are the Atlantic Ocean, Hudson Bay, Arctic Ocean, Pacific Ocean and Gulf of Mexico. View more details on Watersheds - Open Government. Hydrogeological regions are areas in which the properties of sub-surface water, or groundwater, are broadly similar in geology, climate and topography. Hydrogeology is the branch of geology that deals with the distribution and movement of water beneath the earth’s surface. 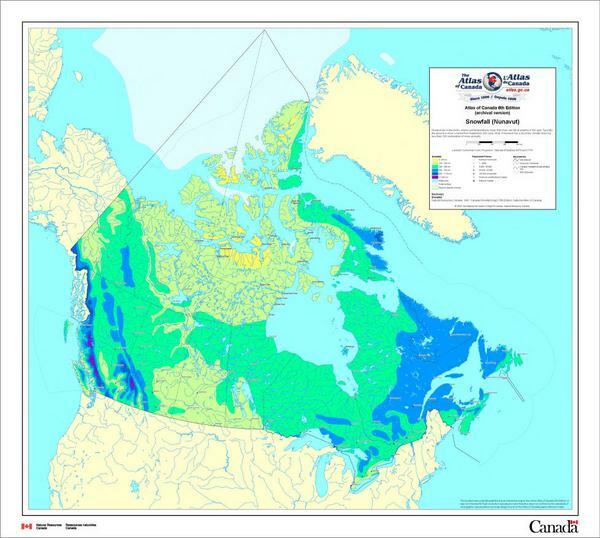 This map shows Canada’s nine hydrogeological regions. View more details on Hydrogeological Regions - Open Government. Glaciers and icefields are huge masses of ice, formed on land by the compaction and re-crystallization of snow, that move very slowly down slopes, or move outward due to their own weight. In Canada, an estimated area of 200,000 square kilometres, or about 2% of the country’s area is covered by glaciers and icefields. A huge quantity of freshwater is frozen in the polar ice caps and in high mountain glaciers. Glaciers and icefields are found in Western Cordillera and the mountains in the eastern Arctic. At present there are no reliable figures on the total number of glaciers in Canada. Glaciers exert a direct influence on the hydrologic cycle by slowing the passage of water through the cycle. Like groundwater, glaciers are excellent natural storehouses of water. 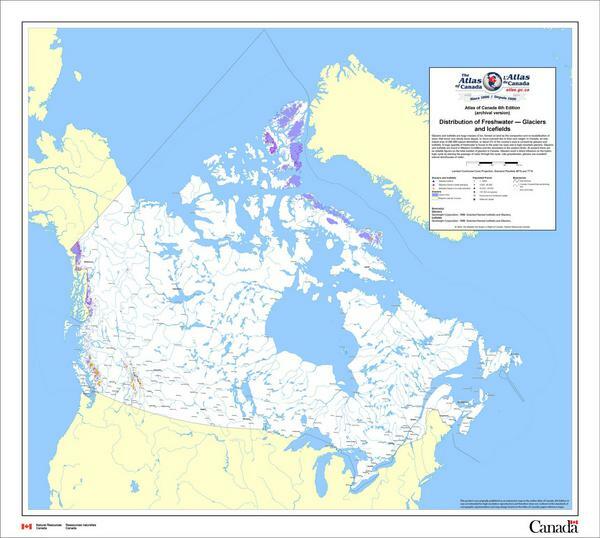 View more details on Distribution of Freshwater - Glaciers and Icefields - Open Government. Wetlands are lands permanently or temporarily submerged or permeated by water, and characterized by plants adapted to saturated-soil conditions. Wetlands are the only ecosystem designated for conservation by international convention because they absorb the impact of hydrologic events, filter sediments and toxic substances, supply food and essential habitat for many species, provide products for food, energy, and building material, and are valuable recreational areas. Some wetlands help recharge groundwater, while others receive groundwater discharge. Wetlands are vulnerable to climatic variations and extreme events. 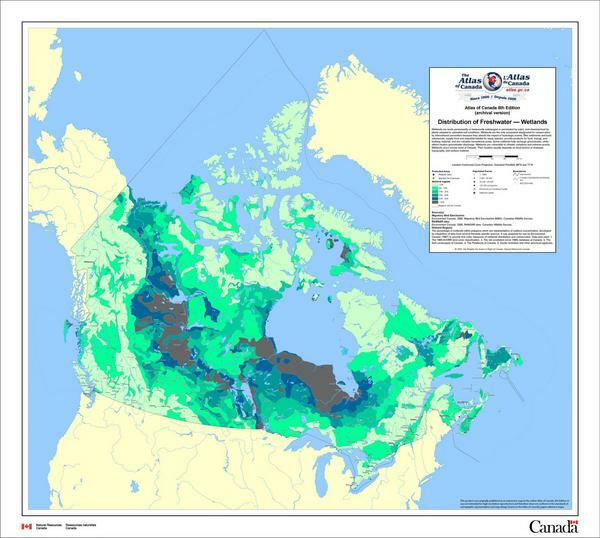 Wetlands occur across most of Canada. Their location usually depends on local factors of drainage, topography, and surface material. 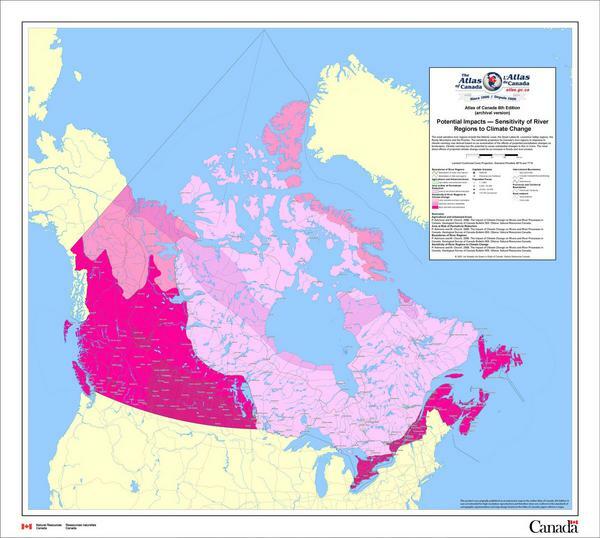 View more details on North America Watersheds - Open Government. 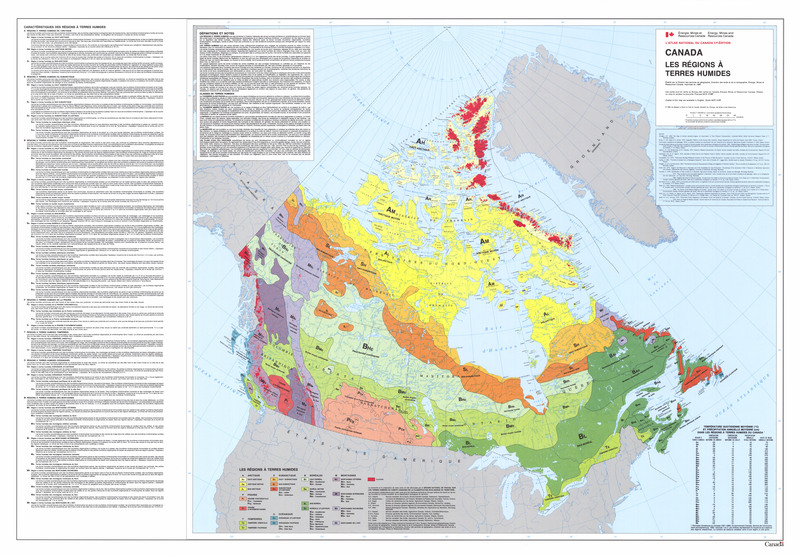 Contained within the Atlas of Canada 8.5x11 series maps is a map which was created as a joint effort by The Atlas of Canada, The National Institute of Statistics, Geography and Informatics, Mexico and the National Atlas of the United States under the sponsorship of the commission for environmental cooperation. 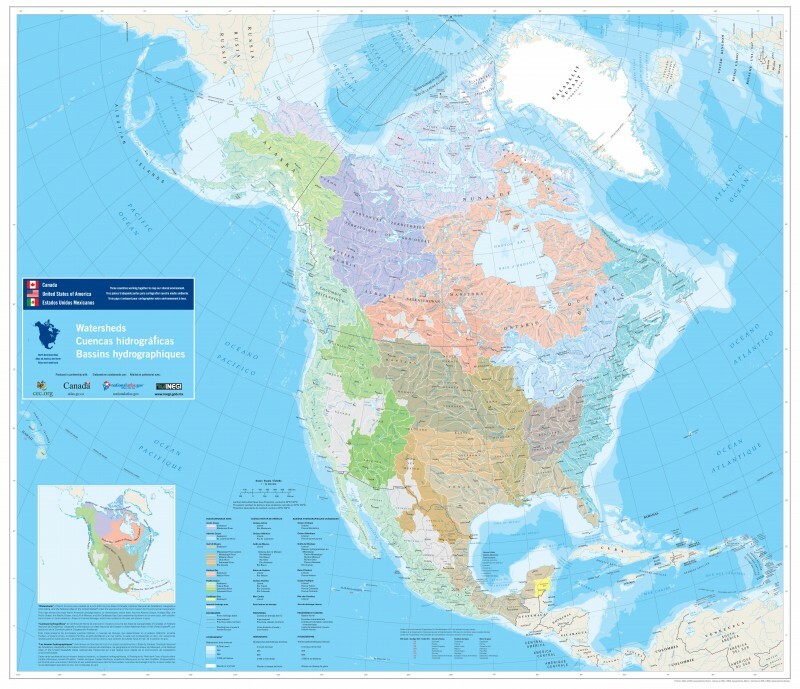 The map shows the major North American drainage basins, or wateresheds, which drain into the Atlantic Ocean, Hudson Bay, the Arctic Ocean, the Pacific Ocean, the gulf of Mexico and teh Caribbean Sea. Each watershed is shown in its own colour, with subdivisions shown in tonal variations. Areas of internal drainage, which lack outlets to the sea, are shown in grey. 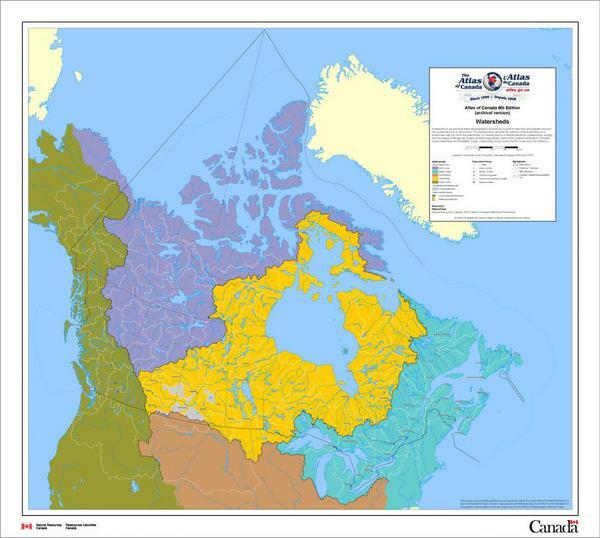 View more details on North America Watersheds - Open Government. Contained within the 5th Edition (1978 to 1995) of the National Atlas of Canada is a map that shows rivers, lakes and glaciers of Canada in great detail without names as a pure pattern on a dark background. View more details on Drainage Patterns - Open Government. 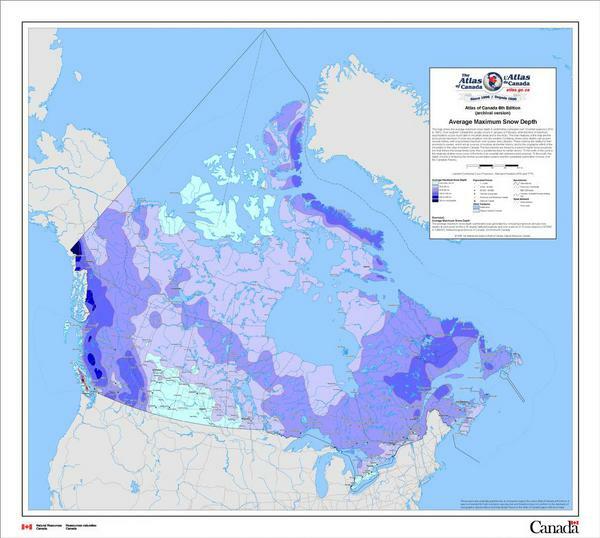 Contained within the 5th Edition (1978 to 1995) of the National Atlas of Canada is a map that shows occurrence of wetlands throughout Canada, using five percentage cover classes. 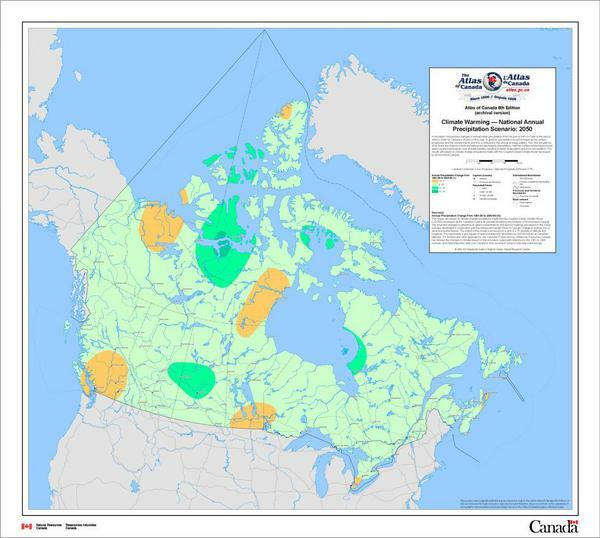 Table gives estimated wetland area by province and territory. View more details on Distribution of Wetlands - Open Government. Contained within the 5th Edition (1978 to 1995) of the National Atlas of Canada is a map that classifies Canada into forty wetland regions with similar ecological characteristics. The tables give temperature and other characteristics of each region. 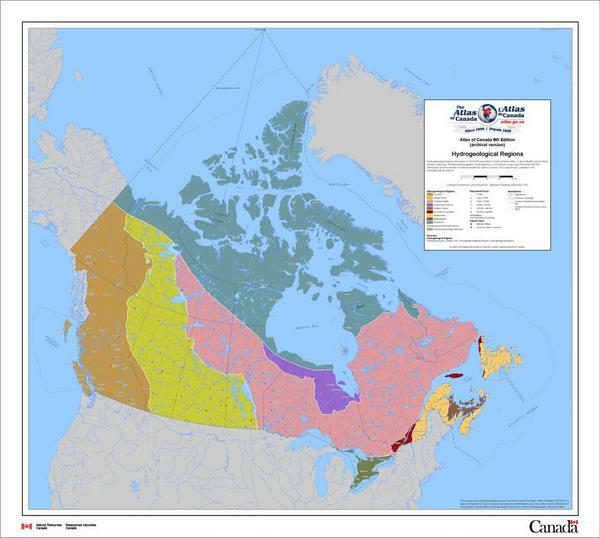 View more details on Wetland Regions - Open Government. The map shows 3172 hydrometric stations, 1491 active and 1681 inactive, located on rivers and lakes across the country. All the stations on the map are situated in a drainage area of 200 square kilometres or more. For 1200 stations shown on the map, surface water level measurements are recorded in real time, every three hours daily, when in operation, although the number of stations recording data varies throughout the year. The map shows the annual mean total precipitation. 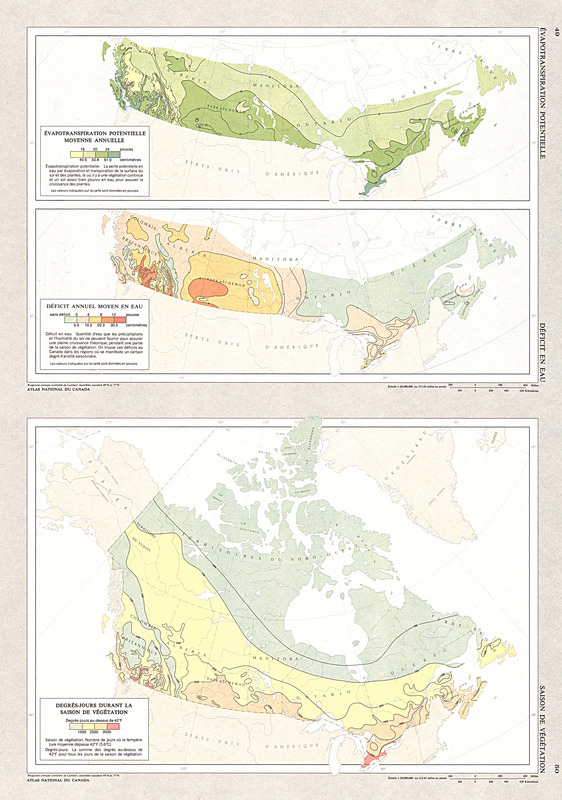 Over much of the continental interior of Canada, precipitation reaches its annual maximum in the summer months and falls as rain. October marks the transition from mainly rain to snowfall across northern Canada. View more details on Annual Mean Total Precipitation - Open Government. 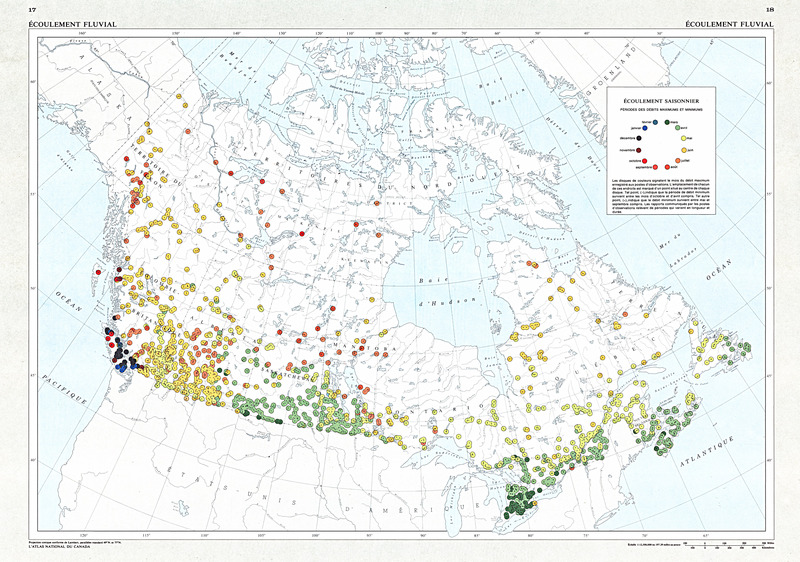 This map shows the average maximum snow depth in centimetres computed over 18 winter seasons (1979 to 1997). Over southern Canada this usually occurs in January or February, while the time of maximum accumulation occurs much later in mountain areas and in the Arctic. The main features of the map are the pronounced maximum in snow accumulation over the western Cordillera, where snow depths can exceed several metres, with a secondary maximum over Quebec and Labrador. These maxima are related to their proximity to oceans, which act as sources of moisture and winter storms, and to the orographic effect of the mountains in the case of western Canada. The two maxima are linked by a band of higher snow accumulation that follows the boreal forest zone; this is a preferred track for winter storms. To the north of this zone is the relatively shallow snow cover of the Arctic (low snowfall with extensive wind packing). To the south, the depth of snow is limited by the shorter accumulation season and the substantial sublimation of snow over the Canadian Prairies. View more details on Average Maximum Snow Depth - Open Government. Nunavut lies in the Arctic, where cold temperatures mean that snow can fall at anytime in the year. Typically the ground is snow covered from September until June. Most of Nunavut has a dry Arctic climate receiving less than 200 centimetres of snow annually. 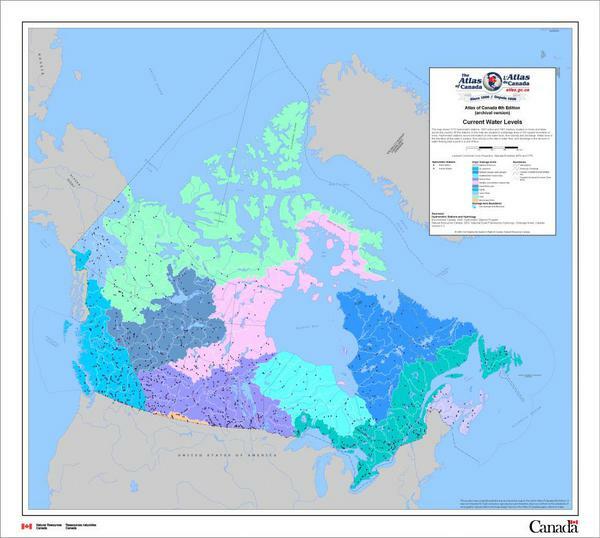 View more details on Snowfall (Nunavut) - Open Government. 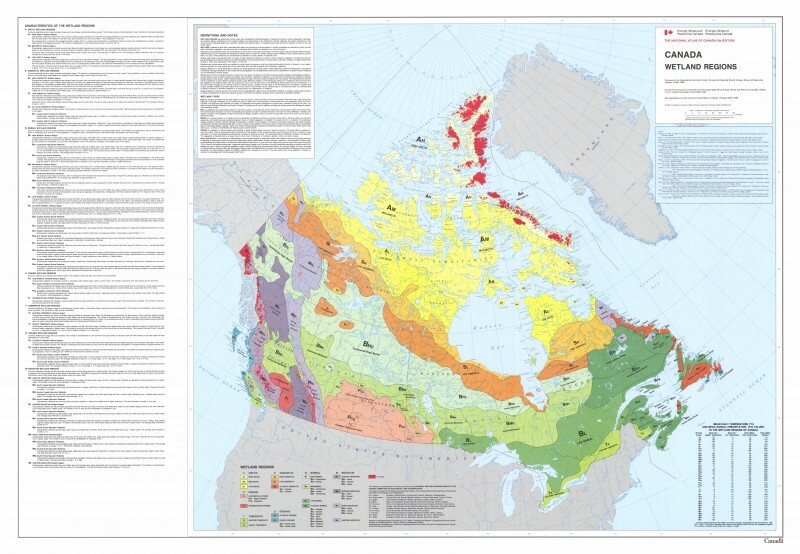 Contained within the 5th Edition (1995) of the Atlas of Canada is a sheet with four maps. The first map shows the average annual river flow for major rivers and has adjacent graphs showing average monthly runoff for 14 selected rivers. The map is coloured by oceanic drainage areas and also shows major drainage divides and diversions. 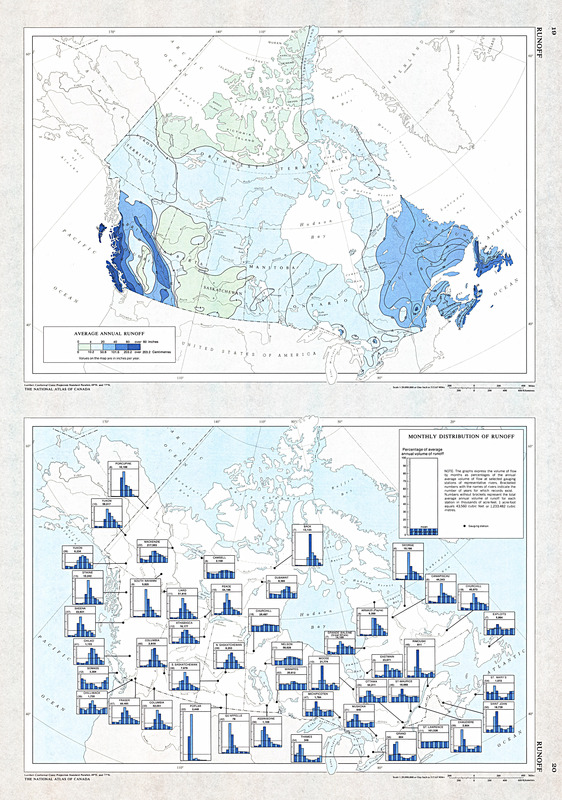 The other three maps are 1:30 000 000 inset maps of Canada: average annual 7-day low flow, average annual peak flow, and average annual runoff. Summary table for drainage areas. View more details on Streamflow - Open Government. 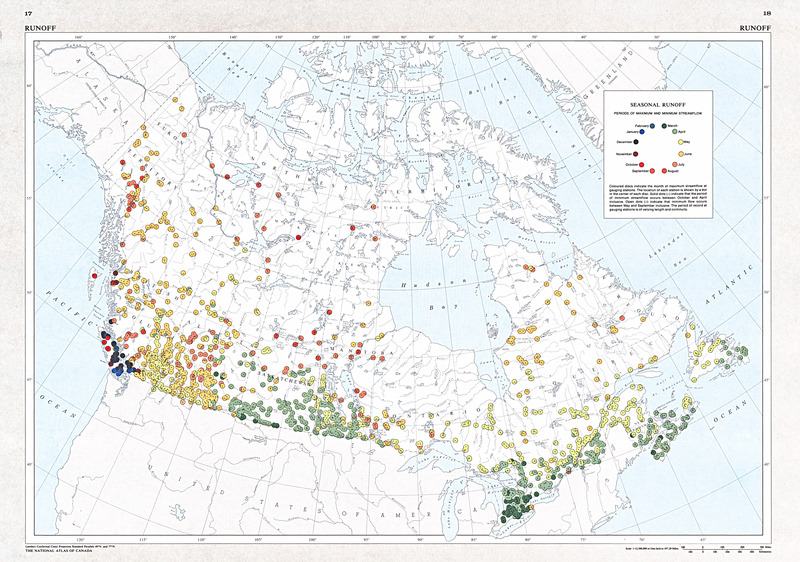 Contained within the 4th Edition (1974) of the Atlas of Canada is a map that shows the amount of seasonal runoff. The map shows periods of maximum and minimum streamflow. The coloured discs indicate the month of maximum streamflow at gauging stations and dots within these discs indicate the period when minimum flow occurs. View more details on Seasonal Runoff - Open Government. Contained within the 4th Edition (1974) of the Atlas of Canada is a map that shows average annual runoff patterns. There is a second map, accompanied by bar graphs for selected gauging stations of representive rivers, which expresses the volume of flow by months as percentages of the annual average volume. View more details on Runoff - Open Government. 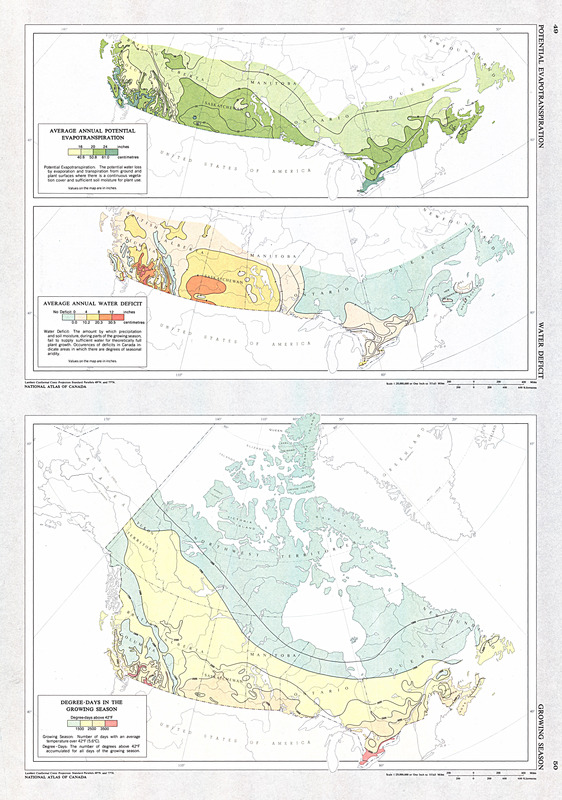 Contained within the 4th Edition (1974) of the Atlas of Canada is a set of three maps relating the effects and dependency of vegetation on environmental variables. One map shows the average annual potential evapotranspiration in inches from ground and plant surfaces for areas where there is a continuous vegetation cover and sufficient soil moisture for plant use. The second map shows the average annual water deficit in inches where, during parts of the growing season, soil moisture is insufficient to supply enough moisture for theoretically full plant growth. The last map shows the accumulated number of degree-days. For the purpose of this map degree-days are calculated from the base temperature of 42 degrees F/5.6 degrees C. The growing season is defined on this map as the number of days with an average temperature over 42 degrees F/5.6 degrees C. View more details on Potential Evapotranspiration - Open Government. A simulation of projected changes in mean annual precipitation from the period 1975 to 1995 to the period 2040 to 2060, is shown on this map. On average, precipitation increases, but it is not evenly distributed geographically. There are marked regions of decreasing, as well as increasing precipitation, over both land and ocean. Annual average precipitation generally increases over northern continents, and particularly during the winter. Warmer surface temperature would speed up the hydrological cycle at least partially, resulting in faster evaporation and more precipitation. The results are based on climate change simulations made with the Coupled Global Climate Model developed by Environment Canada. View more details on Climate Warming - Global Annual Precipitation Scenario: 2050 - Open Government. A simulation of projected changes in December to February precipitation from the period 1975 to 1995 to the period 2040 to 2060 is shown on this map. On average, precipitation increases, but it is not evenly distributed geographically. There are marked regions of decreasing, as well as increasing precipitation, over both land and ocean. Annual average precipitation generally increases over northern continents, and particularly during the winter. Warmer surface temperature would speed up the hydrological cycle at least partially, resulting in faster evaporation and more precipitation. The results are based on climate change simulations made with the Coupled Global Climate Model developed by Environment Canada. View more details on Climate Warming: Global Winter Precipitation Scenario: 2050 - Open Government. A simulation of projected changes in June-August precipitation from the period 1975 to 1995 to the period 2040 to 2060 is shown on this map. On average, precipitation increases, but it is not evenly distributed geographically. There are marked regions of decreasing, as well as increasing precipitation, over both land and ocean. Annual average precipitation generally increases over northern continents, and particularly during the winter. Warmer surface temperature would speed up the hydrological cycle at least partially, resulting in faster evaporation and more precipitation. The results are based on climate change simulations made with the Coupled Global Climate Model developed by Environment Canada. View more details on Climate Warming - Global Summer Precipitation Scenario: 2050 - Open Government. A simulation of projected changes in mean annual precipitation from the period 1975 to 1995 to the period 2080 to 2100 is shown on this map. On average, precipitation increases, but it is not evenly distributed geographically. There are marked regions of decreasing, as well as increasing precipitation, over both land and ocean. Annual average precipitation generally increases over northern continents, and particularly during the winter. Warmer surface temperature would speed up the hydrological cycle at least partially, resulting in faster evaporation and more precipitation. The results are based on climate change simulations made with the Coupled Global Climate Model developed by Environment Canada. View more details on Climate Warming - Global Annual Precipitation Scenario: 2100 - Open Government. A simulation of projected changes in December to February precipitation from the period 1975 to 1995 to the period 2080 to 2100 is shown on this map. On average, precipitation increases, but it is not evenly distributed geographically. There are marked regions of decreasing, as well as increasing precipitation, over both land and ocean. Annual average precipitation generally increases over northern continents, and particularly during the winter. Warmer surface temperature would speed up the hydrological cycle at least partially, resulting in faster evaporation and more precipitation. The results are based on climate change simulations made with the Coupled Global Climate Model developed by Environment Canada. View more details on Climate Warming - Global Winter Precipitation Scenario: 2100 - Open Government. A simulation of the projected changes in June to August precipitation from the period 1975 to 1995 to the period 2080 to 2100 is shown on this map. On average, precipitation increases, but it is not evenly distributed geographically. There are marked regions of decreasing, as well as increasing precipitation, over both land and ocean. Annual average precipitation generally increases over northern continents, and particularly during the winter. Warmer surface temperature would speed up the hydrological cycle at least partially, resulting in faster evaporation and more precipitation. The results are based on climate change simulations made with the Coupled Global Climate Model developed by Environment Canada. View more details on Climate Warming - Global Summer Precipitation Scenario: 2100 - Open Government. 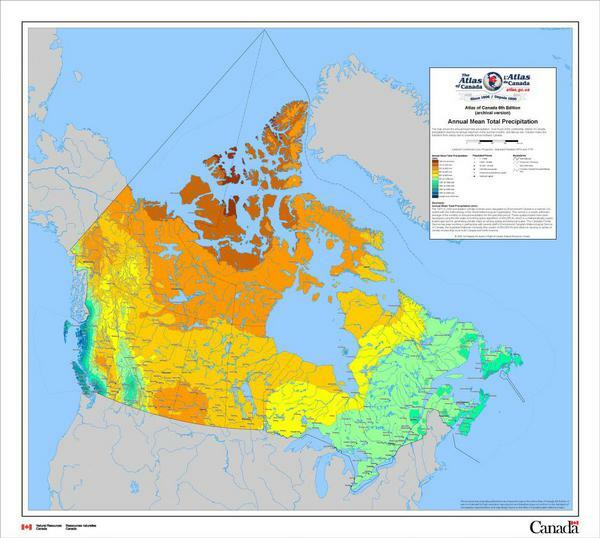 A simulation of projected changes in annual mean precipitation from the period 1961 to 1990 to the period 2040 to 2060 for Canada is shown on this map. In general, precipitation would increase as the century progresses and the climate warms and this is reflected in the annual average pattern. Also, the simulations show there are regions of both increasing and decreasing precipitation. Warmer surface temperature would speed up the hydrological cycle at least partially, resulting in faster evaporation and more precipitation. The results are based on climate change simulations made with the Coupled Global Climate Model developed by Environment Canada. View more details on Climate Warming - National Annual Precipitation Scenario: 2050 - Open Government. A simulation of projected changes in winter (December to February) precipitation from the period 1961 to 1990 to the period 2040 to 2060 for Canada is shown on this map. In general, precipitation would increase as the century progresses and the climate warms. Projected precipitation changes are not evenly distributed geographically or seasonally. Precipitation is projected to decrease slightly for some higher latitude regions. Warmer surface temperature would speed up the hydrological cycle at least partially, resulting in faster evaporation and more precipitation. The results are based on climate change simulations made with the Coupled Global Climate Model developed by Environment Canada. View more details on Climate Warming - National Winter Precipitation Scenario: 2050 - Open Government. 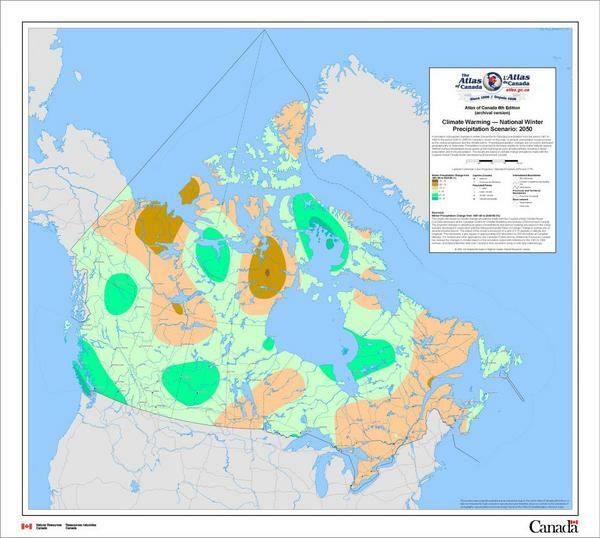 A simulation of projected changes in summer (June to August) precipitation from the period 1961 to 1990 to the period 2040 to 2060 for Canada is shown on this map. Projected precipitation changes would not be evenly distributed geographically. Summer patterns show regions with both increases and decreases in precipitation. Warmer surface temperature would speed up the hydrological cycle at least partially, resulting in faster evaporation and more precipitation. The results are based on climate change simulations made with the Coupled Global Climate Model developed by Environment Canada. View more details on Climate Warming - National Summer Precipitation Scenario: 2050 - Open Government. The most sensitive river regions include the Atlantic coast, the Great Lakes-St. Lawrence Valley regions, the Rocky Mountains and the Prairies. 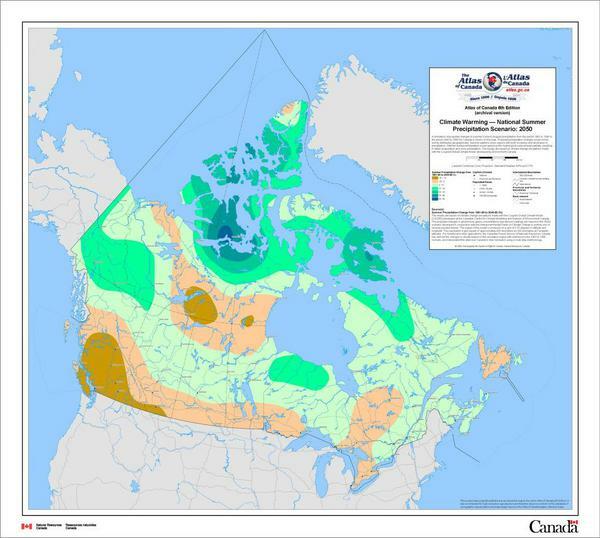 The sensitivity projection for Canada's river regions in response to climate warming was derived based on an examination of the effects of projected precipitation changes on landscapes. Climate warming has the potential to cause substantial changes to flow in rivers. The most direct effects of projected climate change would be an increase in floods and river erosion. View more details on Potential Impacts: Sensitivity of River Regions to Climate Change - Open Government.